In this tapestry "French Aubusson" we see a work inspired by the French tapestry makers from the Aubusson region. Here we see a floral design of various elements which includes an acanthus leaf border so reminiscent of the elements of nature used in verdure tapestries in France and Belgium. 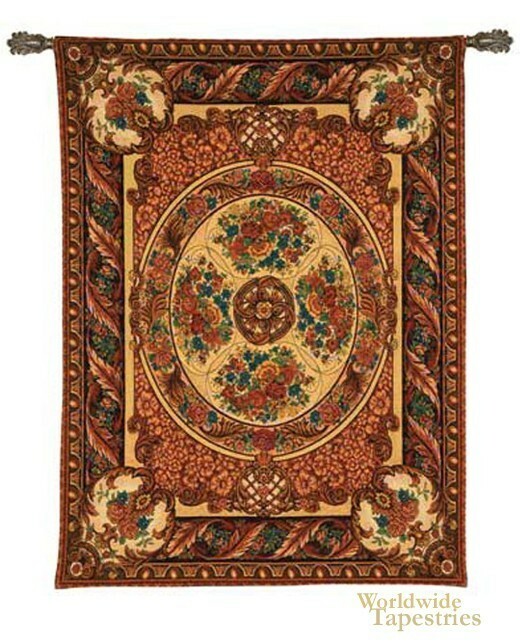 This art tapestry "French Aubusson" is backed with a lining and has a tunnel for easy hanging. Note: Tapestry rods, where pictured, are not included in the price.